More news from Michael Mahan at Worth Avenue Yachts as he lists the classic 26.5m motor yacht Blue Star for sale. Built by Burger in 1987 to a design by Jack Hargrave, this yacht has been maintained in exceptional condition and comes with a generous saloon, raised pilothouse helm station with bridge stairs, private dining room for eight and modern galley. 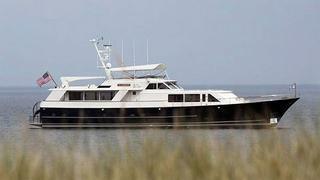 Accommodating six guests in three staterooms, Blue Star is available to view in Fort Lauderdale, asking $1.695 million.